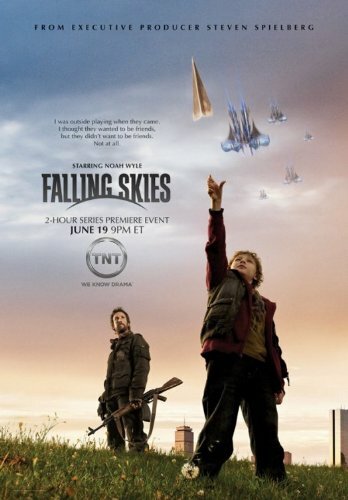 Father's Day was a fitting premiere date for TNT’s new series, Falling Skies. The story depends mightily on the concept of family connections and fatherly love. It is also about a massive alien invasion that has attacked all major cities, wiping out most communications, electricity, and most of the world's military. These are the Spielbergian influences present in Falling Skies. Set in greater Boston about six months after the invasion, the plot centers on Tom Mason (Noah Wyle), a former history professor. He’s become one of the leaders of the 2nd Massachusetts regiment, a group of mostly civilians or retired military personnel. His wife died in the initial attack, and his middle son Ben has been kidnapped by the aliens. The aliens seem to have a penchant for teenagers; many children of that age have been taken and “harnessed” with a strange contraption that looks like an exoskeletal spine. Tom has two remaining sons. Eight-year old Matt is appropriately needy (but not bratty), expressing disappointment at his birthday party postponement, but he’s still engaging and wants to help. His older brother Hal has gone from care-free popular athlete to capable resistance fighter. The setting is as bleak and stark as the Terminator films or any post-apocalyptic flick really, and the dialogue, though corny at times, aptly underscores the imagined fragility and uncertainty of a child, or anyone in those circumstances. “It’s okay – you and your dad, and Hal – are OK."
This is all fine, but does it work? Is it good? Absolutely. The action is crackling and tense. The above dialogue segues immediately into a powerful scene with Tom and Hal being chased by the aliens, huge robotic bi-peds called Mechs. Another instance of producer Steven Spielberg’s touch, though the fright level is undoubtedly more War of the Worlds than ET or Goonies. The two-hour premiere brought us through some skirmishes in which South Boston has “fallen” and the orders are given for the 2nd Mass to retreat from their current location. And if the commander of these regiments look familiar, it’s because it’s Dale Dye, the retired Marine Master Sargent who has been pulling double duty in Hollywood, acting as a military tech advisor, and also playing roles in films and TV shows such as Saving Private Ryan, Band of Brothers, Chuck, and Commander-in-Chief. He’s also voiced characters in several Medal of Honor video games. It’s great casting choices like this that makes a show more engaging. Another welcome addition is Moon Bloodgood (Terminator Salvation), who plays Anne Glass, a pediatrician who needs to also act as surgeon, obstetrician, and therapist as the battles continue. And what else will unfold during this new series about Earth vs. aliens? Falling Skies presents some nice twists and sub-plots: challenging belief systems of both civilians and military, understanding the importance of the human adolescent to the aliens, understanding the aliens’ capacity for what might look like emotion; these ideas will be explored in the coming episodes, along with some nice suspenseful turns, and more than decent action. Great to see you back in action, Mary ! And this show certainly seems to fall in line with Spielberg's darker influences, tough as you mention there's a lot of humanity and potential for character development baked in as well. I expected to be much more entertained by this extended premiere episode, but it left me barely interested in coming back for more. The characters are flat, the theme is tired, and its moribund writing just hasn't brought anything special to the table. Heck, even the V reboot was more fun and that show turned into a colossal mess! Want survivors adapting to a post-apocalyptic world? Watch (or even better, read) The Walking Dead. Want a ragtag group of rebels fighting their evil alien overlords? Battlestar Galactica. A widower struggling to connect with his boys? My Three Sons. Sure, it's tough to offer an original take on an alien invasion, but where is the mythology, the end game, or even some worthwhile subplots to get us invested in the show's progress? All we have so far is Tom wanting to rescue his son. Yawn. The only thing that intrigued me in the whole two hours was why the multi-legged alien skitters use bipedal mechs, although the rebels probably already answered that question if their theory is correct. I found myself completely uninterested in Tom and his kids, his inevitable romance with Anne, or the future of the rebels. I thought this was a stunningly weak debut, and if they can't even knock our socks off in a double-length premiere, why should we stick around? Well, my chief complaints were that sometimes the writing was spotty, and a couple moments seemed forced. But nohting (for me) so bothersome it was worth getting into in the review. And this is over the course of several episodes. (I think six?) But still, I found much to be intrigued with, which outweighed the awkward moments. And it definitely caught the interest of my 16 yr old, he's watched most of the eps with me, and he has a pretty good BS dectector. Stick around a little more?